St. Johns Law Group is St. Augustine Beach’s full service law firm, representing clients in real estate, commercial and residential, litigation, construction disputes, land use and development, corporate and business law, probate and estate planning, family law and divorce, bankruptcy and disputes related to property. We serve clients in the St. Augustine, Beach, Ponte Vedra, Nocatee, and St. Johns, Florida areas. Also, we provide real estate closings at title company prices. Seller: St. Johns Law Group, P.A. 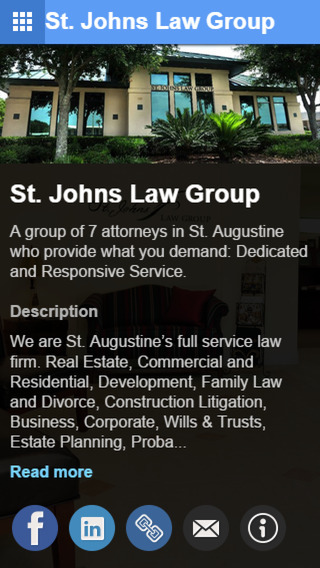 St. Johns Law Group and its team of attorneys and staff are committed to providing dedicated and responsive service in the St. Augustine, Beach, Ponte Vedra, Nocatee and St. Johns, Florida, areas. Whether a residential real estate transaction being closed at title company prices, planning for the future of a business or estate, or a complex civil litigation case, our attorneys are focused on getting the job done efficiently and meeting client expectations and time deadlines. Aside from being a full-service commercial and residential law firm, St. Johns Law Group also serves as City Attorney for the City of St. Augustine Beach and General Counsel for the Airport Authority. We understand the dynamics of St. Augustine Beach, Florida.